of divorce on a child, and sins of the father being visited on the child is a film we really recommend. With Successful premier in Banjul on 26th December 2011 and UK on Feb 12th ,Ruke Amata is planning a Lagos premier in June followed by Cinemas screening across Nigeria. 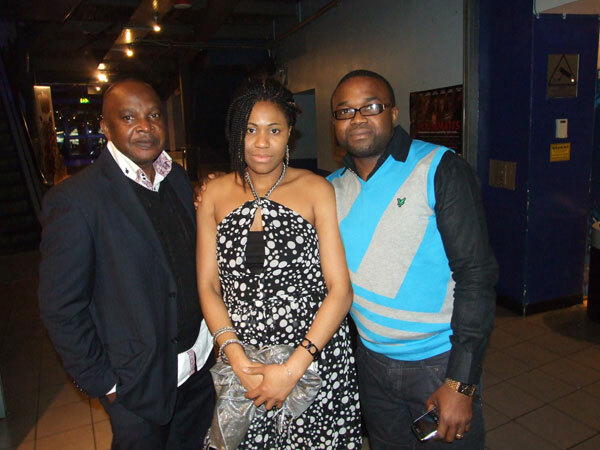 The Past Came Calling without asking for it has changed the African UK movie landscape and if the feelers from those who stormed the UK premiere, an Amata has successfully crossed the Atlantic to do what his Clan do best. The storyline of the Movie is simple, yet intriguing and contains twists and turns. ‘The Past Came Calling’, produced and directed by Ruke Amata, a seasoned Producer and Director, is a movie about a young Medical Student, Susan (Marie Kumba Gomez – the winner of Class Act UK 2011) who came to the UK to study with her sister, Maggie (Chioma Chukwuka-Akpotha). Dumelo). But, like the saying goes, the heart is not so smart. They met and began, what became a sizzling romantic relationship, until events of the past came calling. and resultant prejudices of the past? Produced and directed by Ruke Amata, a seasoned producer and director of such programmes like the TV drama series “Bachelors”, S.O.D – Son of the Devil, The Accursed, Growing Up, Emotional Hazard, and a host of others. The movie has previously been premiered in the Gambia over the Christmas period, and the reactions from the teeming crowd that went to watch it was basically the same. It had in attendance dignitaries from the government, including the Minister of Health, and representatives of the Minister for Youth and Sports, the Minister of Education and the Ministry of Arts and Culture.